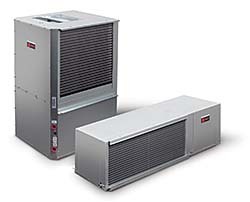 The horizontally configured water-source units are part of the Axiom™ variable-speed portfolio. Available in sizes up to 5 tons, the pumps are capable of delivering an energy-efficiency rating of 40 and potential energy savings of up to 60 percent, when compared to conventional water-source heat pumps. Proprietary control algorithms are factory programmed to maximize efficiency of onboard eFlex™ technology, optimizing compressor and fan speeds based on changing demands. The horizontal configurations provide design flexibility and can meet the space requirements for a variety of buildings.